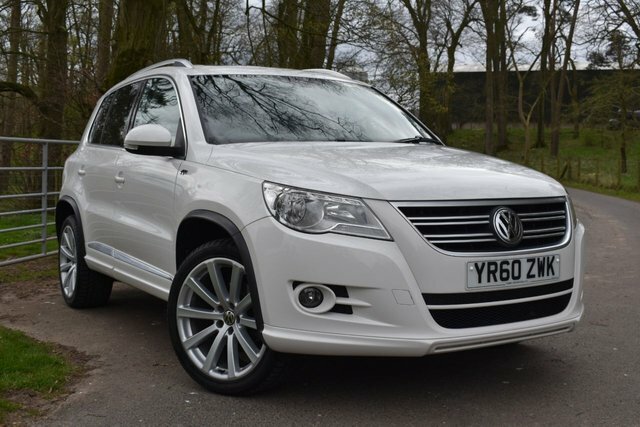 Sammy Lees Motors are delighted to welcome into stock as the result of a local part exchange this 2010 60 Plate Volkswagen Tiguan 2.0L R Line TDI 4Motion (4 wheel drive). Finished in the sought after Candy White which is perfectly complimented by a classic Black cloth R Line embossed upholstery with heated front seats & 19" 10 spoke alloy wheels. The Volkswagen Tiguan is a premium alternative to models like the Nissan Qashqai, with plenty of space and impressive technology and engines. A sportier look is available from this aggressively styled R-Line, with its angular bodykit and model-specific alloy wheels, while a sports steering wheel enlivens the interior. This vehicle is a Volkswagen Tiguan 4Motion so like the smart suspension, this system lets wheels move independently, giving drivers a better start on mud, sand or snow & the system uses electronic synchronisation to deliver effective torque at low speeds. This vehicle further benefits from a full detailed service history having been serviced at 8,085 miles by VW on 6.9.11, 14,620 miles by VW on 6.9.12, 18,886 miles by VW on 28.5.13, 22,415 miles by VW on 26.11.13, 30,863 miles by VW on 28.11.14, 40,932 miles by VW on 27.11.15, 60,941 miles on 15.9.17, 66,567 miles on 13.6.18 & will receive a full detailed service as well as 12 months MOT prior to collection & 1 years FREE full in house warranty which can be used at any VAT registered UK garage - offering complete peace of mind. * Panoramic Electric Sunroof, * Leather Multi Functional Flat Bottomed Steering Wheel, * Automatic Headlights, * Electronic Hand Brake, * Front Fog Lights, * Auto Hold, * Chrome Foot Pedals, * Colour Touch Screen Audio Visual Display, * Radio/CD Player,* Front & Rear Electric Windows, * Heated & Electric Wing Mirrors, * Dual Zone Climate Control, * Dual Cup Holder, * Tiguan Embossed Chrome Scuff Plates, * Automatic Dimming Rear View Mirror, * Chrome Roof Rails, * Rear Privacy Glass, * ISOFIX, * Volkwswagen Leather Hand Book Pack, * 2 Remote Control Key Fobs + Much More! Buy With Complete Peace Of Mind With Sammy Lees Motors Ltd As We Are A Independent Family Run Business With Family Values Ensuring That We Provide First Class Customer Service. We Welcome Part Exchange And Are More Then Happy To Advise In Regard To The Best Possible Finance Options Available. Find Us Situated Just Off The A66 In Appleby In Westmorland - Postcode CA16 6HX. Viewing Can Be Arranged 7 Days A Week Anytime Day Or Night By Calling On 017683 53238 Or 07841 135262.